There are currently 4,012 users on this website. Pictured below is a postcard from my collection. 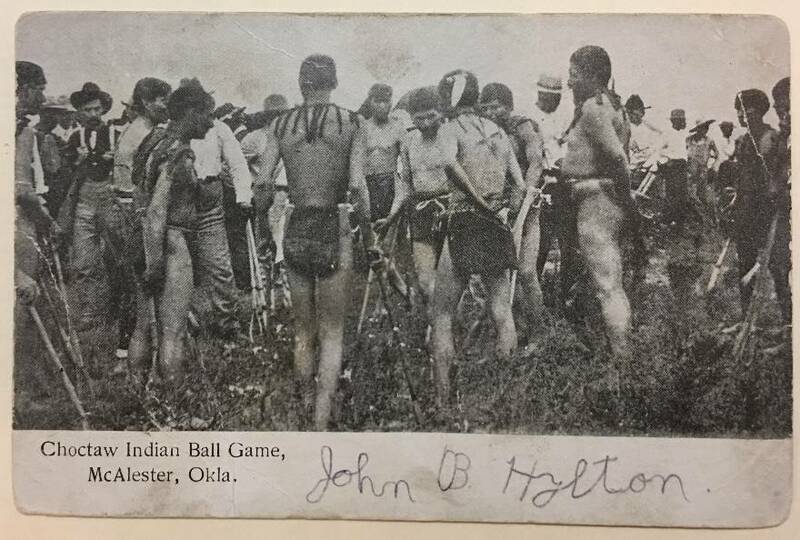 The front of the card shows a Choctaw Indian Ball Game in McAlester, OK. The game was similar to lacrosse. Here is the back of the card. 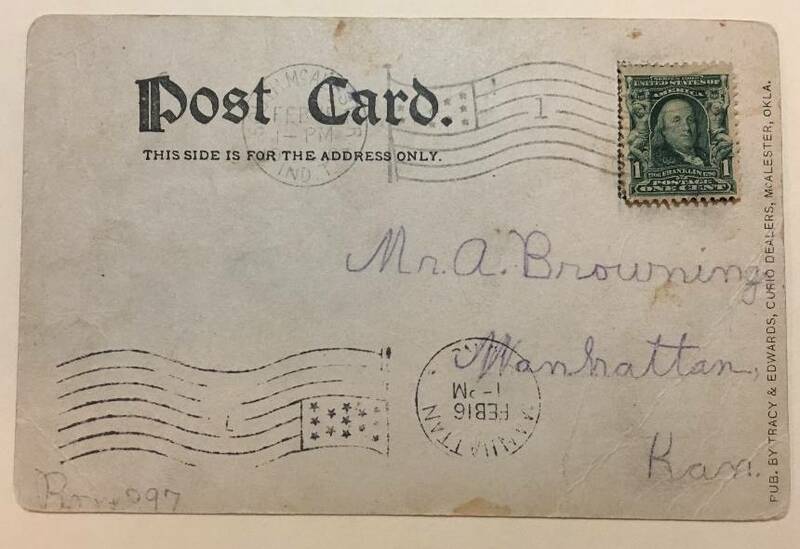 The card is addressed to Mr. A Browning, Box #397, Manhattan, KS. The card was postmarked in South McAlester, Indian Territory on Feb (15)th 1907, and posted as received in Manhattan, KS on Feb 16th (1907). South McAlester: South McAlester existed from ca. 1888 until July 1st, 1907. The town was founded when investors could not come to terms for a right of way for a coal railroad through the town of McAlester, so bought land south of the town. South McAlester stopped being a separate town from McAlester when Congress passed an act joining the 2 towns into one, named McAlester. The United States Post Offices then designated the two as one on July 1st, 1907. This all occured about 5 months before Oklahoma statehood on Nov 16th, 1907. McAlester, OK: Founded as Perryville in 1838 on the crossroads of the E-W California Road and the N-S Texas Road in Choctaw Nation. James Perry had married into the Choctaw Nation, so was able to establish a trading post on the spot. The town existed until Aug 26th 1863, when Union Forces burned the town for being a Confederate supply depot. J.J. McAlester, who also married into the Choctaw Nation, set up a trading post on the spot in 1869. He convinced the Union Pacific Railway to connect to the town (named McAlester) due to the coal deposits in the area. McAlester still exists today and is the largest city in the Choctaw Nation of Oklahoma. Mr. A Browning: The recipient of the card is Mr. Asaph "Asa" Browning (b. 1831 in Petersham, MA, d. 1913 in Manhattan, KS). At some point during his lifetime (prior to 1857), Asa relocated from MA to Manhattan, KS. 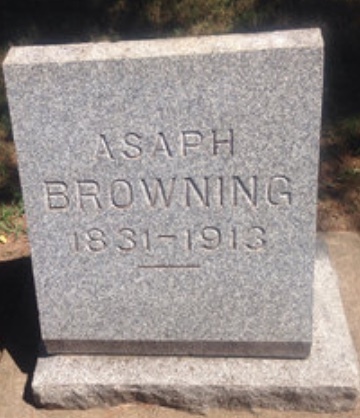 Among his 5 children was a daughter: Hattie Browning Hylton (b. 1868 in Manhattan, KS, d. 1934 in Manhattan, KS). 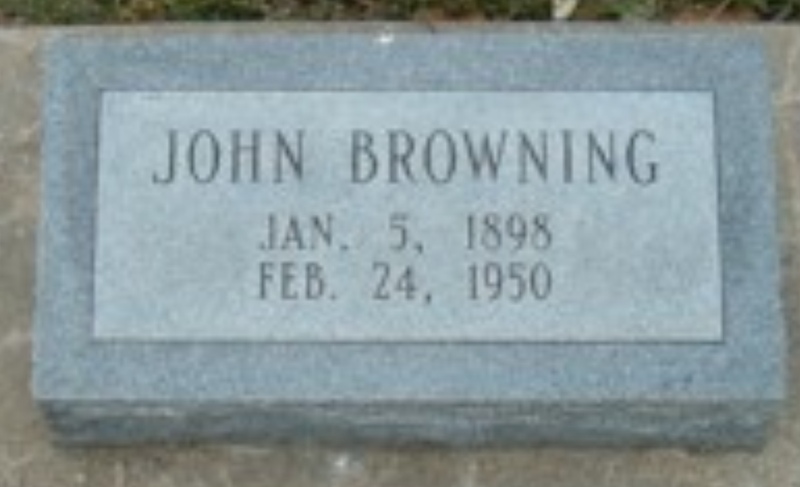 In the 1940 census, John is listed as living on RR1 in Manhattan, KS with his sister Mary and his maternal uncle Charles Browning. Virginia never married (nor did John or Mary) so I don't know where she lived at the time of the census. Here is a picture of John, Mary, Virginia and Uncle Charlie in front of their house on RR1 in Manhattan, KS. As my grandparents were the sole residents on the new road, they were allowed to name the road, with the city's approval. 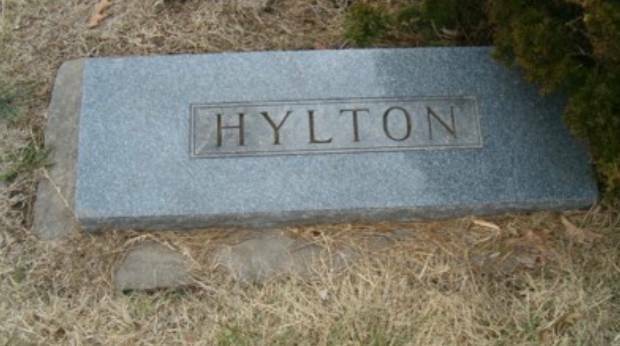 They chose the name "Hylton Heights." Hylton for John, Mary and Virginia, who lived in the house at the time, and Heights because the houses were on the end of a ridge. In the map above, where Hylton Heights angles to the left is a steep decline. 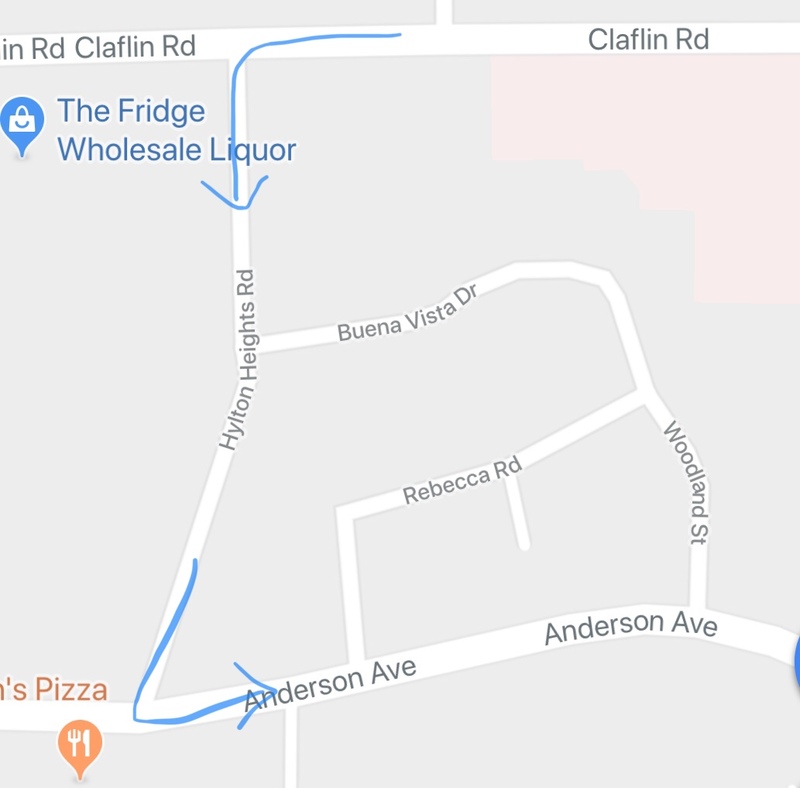 Both the liquor store and pizza place are downhill from the Hylton house. Mary and Virginia gave this card to me when I was a child, along with a few covers, when they learned of my budding interest in philately. My grandfather had been postmaster of Manhattan, KS, so he got me started. 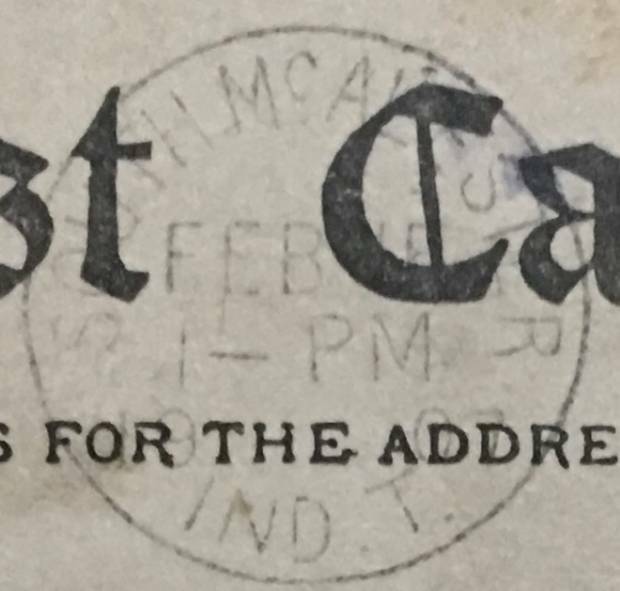 I love the postal history of (and personal connection I have with) this postcard. 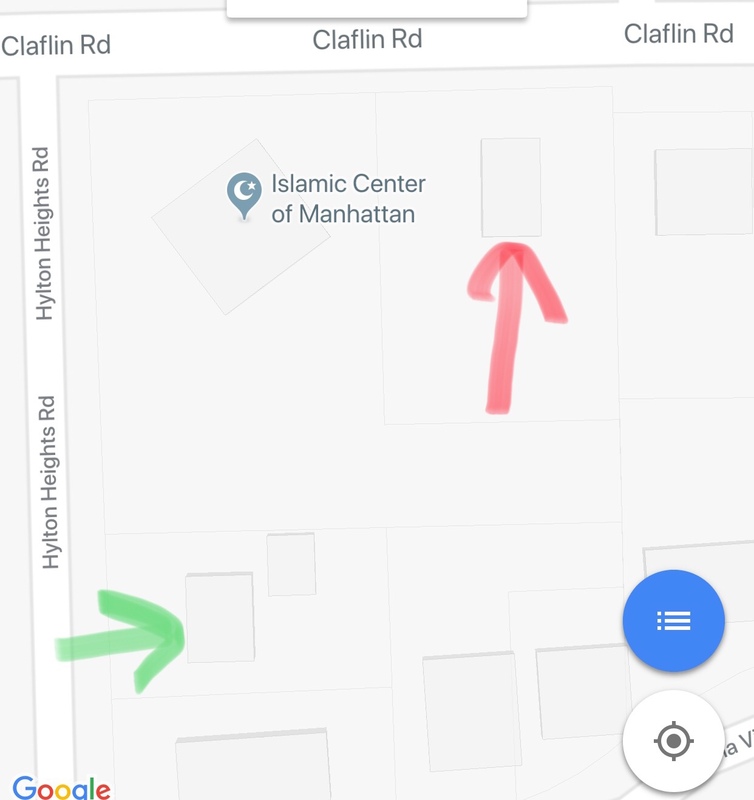 The sender had a road, albeit 2 blocks long, named after him, the card was sent from a town that ceased to exist 5 months later in a Territory that ceased to exist 9 months later. Hope you enjoyed my story. I do have a conservation question about the card: the US 300 is starting separate and is only attached by about the top third right now. What can/should I do either tokeep it from getting worse and/or repair it? When a card or cover has little/no value, and I just want the stamp to stay put, I wet the back of the stamp with a bit of clean water and give it a good pressing, in the hope that a little residual adhesive and some fiber-to-fiber surface contact will do the job without my introducing any new materials. It took 0.34 seconds to lick this stamp.